The expansion of Flaget’s Cancer Center is inching closer to reality with a generous donation from Heaven Hill. Representatives of the distillery visited the center late Thursday morning to present a check — large in both size and amount — to help with the center’s plans to add treatment rooms, an in-house pharmacy and to improve its resource center. 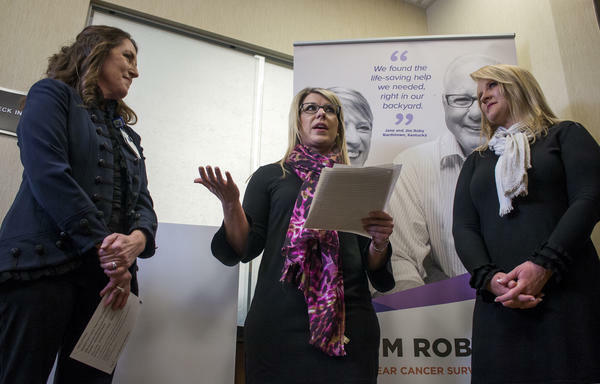 Heaven Hill Senior Accountant Julie Johnson, center, speaks about employees’ efforts to raise money for the Flaget Cancer Center. A check for nearly $28,000 was presented to the center Thursday morning, a combination of employee fundraising and a match from the distillery. Julie Johnson, senior accountant for Heaven Hill Brands, said the distillery encourages employee-driven fundraising initiatives every year as part of a philanthropy project, with Heaven Hill matching donations up to $5,000. Johnson’s team proposed fundraising for Project Hope, an ongoing initiative of the Flaget Memorial Hospital Foundation to improve cancer resources in Nelson County. The hospital recently celebrated the completion of the project’s first phase to install 3D mammography equipment, and the second phase of Project Hope is to increase patient capacity at the Flaget Cancer Center with an expansion. Over the course of several months, employees held raffles, hosted a Go Fund Me campaign, took part in payroll deductions and collected thousands in private donations. Johnson said the goal was to raise $10,000, inclusive of the company match. By the end of the fundraising efforts, however, employees had raised nearly $13,000 on their own. With the $5,000 company match, the efforts generated about $18,000. But Johnson had an additional surprise for the center during Thursday’s presentation, explaining that, because of the dedication and passion shown by employees, Heaven Hill agreed to donate an additional $10,000, bringing the donated amount to just shy of $28,000. Hospital representatives were appreciative of the donation. “You have warmed my heart,” said Dr. Monte Martin, who specializes in medical oncology and hematology at the cancer center. “This is very impressive. The donation will allow for naming rights of two exam rooms — one for those undergoing radiation and one for those undergoing chemotherapy. While the majority of the donation will help directly with the expansion, a portion of the funds raised will also be used to donate Hope Scarves to the facility’s resource center. Hope Scarves is a Louisville-based nonprofit that collects headscarves worn by cancer survivors and gives them to others currently in treatment as part of sharing stories and providing hope. Thursday’s donation is not the first time the local distillery has been involved with Project Hope. The Bourbon Heritage Center previously donated $5,000 of proceeds from a 50 Shades of Pink event to the campaign as well.